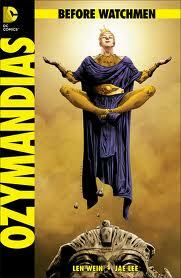 Out of all the pre-hero biographies to be featured in DC’s Before Watchmen series, it was my contention before even picking up this comic book that Ozymandias would be the most well received from modern day readers. When Gibbons and Moore’s Watchmen was originally published in the mid-1980’s it wasn’t as common to root for heroes whose IQ was higher than what they could bench press. But, time warp good ol’ smarty pants “Ozy” into today’s culture where the most popular shows on television are about quirky, so-genius-I’m-crazy type of investigators solving crimes, suddenly you’ve got a leader and a hero that people can relate to and believe in. The limitless intellectualism, and the not to be overlooked learned athleticism, of Ozymandias is expertly explored in this first issue of Before Watchmen with a brief but telling glimpse into his formative years of grade school, followed by the sad yet motivational and untimely death of his parents. Like all of the Watchmen prequels, this one too lives up to the impossible precedence of an unbelievably high standard. I’m looking forward to dipping my face into the Harry Potter memory water bird bath again later in August to see a youngster Rorschach and a pimple-faced Dr. Manhattan before they hit puberty, started wearing sacks over their faces and turned blue. When you hear a title like Danger Club, you might be inclined to hearken back to the days of when teenagers would dance on television and pretend to still be interested in an animated talking mouse. Don’t be fooled, this comic is neither for kids or about kids. They may look like they should be attending prom rather than saving the world, but in a time when everyone is dead and it’s up to a bunch of children to save mankind, then I say, a kid’s gotta do what a kid’s gotta do. The body count is rising and the surviving members of the crime fighting club are starting to turn on each other. The weight of the burden of the alarming death toll of their friends and loved ones is beginning to confuse the tender minds of the young crew. My only hope is that they can hold it together long enough to defeat the bad guys. Also, the President of the United States in this book couldn’t have possibly ever been the victor of an honest majority vote, right? I know the election process for the most important office in the country isn’t supposed to be a beauty contest, but geez is that guy ugly. I would hate to see how he looks without the mask! 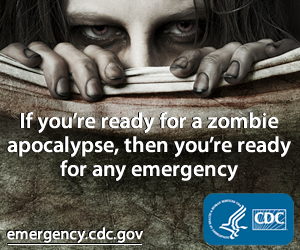 The path of curing mutants is rigorous and not to mention highly controversial…just ask the X-Men. 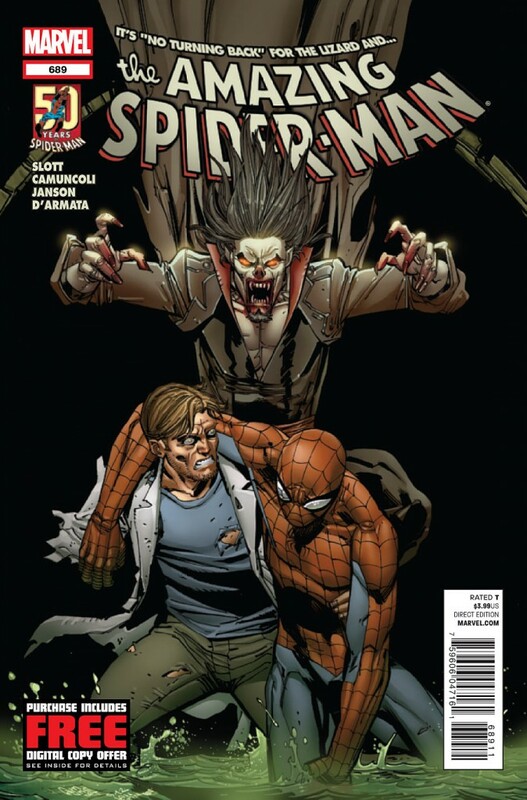 In The Amazing Spider-Man issue #689, Spidey finds himself working alongside Morbius the Living Vampire in an attempt to genetically “cure” and de-reptile The Lizard. Was the experiment successful, you ask? Well, let’s put it this way…is a Leopard still a Leopard even if it loses its spots? The minute Spider-Man runs off playing the diplomat with a reformed Morbius, the friendly neighborhood Vampire, Doctor Connors (aka Lizard brain) immediately starts plotting devious plans to get his scales back. 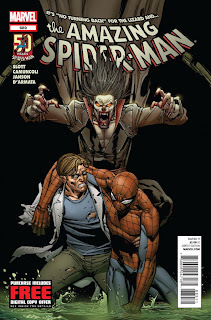 Even before writer Dan Slott could squeeze in one more Twilight jab, Morbius and Spider-Man find themselves punching each other in mid-air while falling down skyscapers in a blaze of comics action glory. However, although Vampires are by nature evil beings and despite the fact that Morbius may just be getting what’s coming to him, there is a feeling that the real battle is actually with sneaky Doc Connors; who is still back at the lab playing with genetics like a cackling mad scientist. So if Morbius and Spidey could hurry up a little with their midtown bar brawl and get back to Horizon Labs in time to stop the Lizard King from infecting mankind with his green lizzy liquid, that would be great…thanks. The Future of Comics is Marvel NOW! Raise your fist and "Join the ReEvolution" as Marvel introduces Marvel Now! one of the biggest comics campaigns since DC relaunched the new 52s in 2011. This Fall, the Marvel Universe will head in an exciting all-new direction, as the industry’s top creators join the top Super Heroes-- Iron Man, Thor, Captain America, Hulk, Spider-Man, Wolverine and more-- to deliver all-new ongoing series, each beginning with issue #1! Marvel NOW! is the culmination of Marvel ReEvolution, the groundbreaking new initiative to evolve the comic book experience through innovation. The Marvel Now! initiative kicks off in October’s Uncanny Avengers #1, from the superstar dream team of Rick Remender (Uncanny X-Force,Venom) and John Cassaday (Astonishing X-Men, Captain America) and continues with jaw-dropping new Marvel NOW! series nearly every week through February. Then in November, Marvel NOW! expands to all corners of the universe with launches includingAll-New X-Men #1 by Brian Michael Bendis (Avengers VS. X-Men, Ultimate Comics Spider-Man) and Stuart Immonen (Avengers VS. X-Men #1 Infinite, Fear Itself);Avengers #1 by Jonathan Hickman (Avengers VS X-Men, Fantastic Four) and Jerome Opena (Uncanny X-Force), on-sale in December; andNew Avengers #1, by Hickman and Steve Epting (FF, Captain America), on-sale in January 2013.